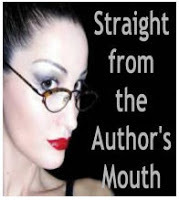 Welcome to Straight from the Author's Mouth! What will you see here? Authors giving us the straight facts about anything writing or promotion related. Or whatever they feel like posting. After all, this is straight from the author's mouth and who knows what will come out! This is a group blog made up by a bunch of lovely ladies who love books, love the authors behind the books and who needed a place to let these authors give their views on the writing, publishing and promoting world so that you can get the real facts. Sit back, hang tight and read what these authors have to say. Be sure to check out their links in the right hand sidebar!